View the Solar Eclipse anywhere on Monday! Everybody’s talking about it. It’s going to be one of the most spectacular astronomical events in American history! 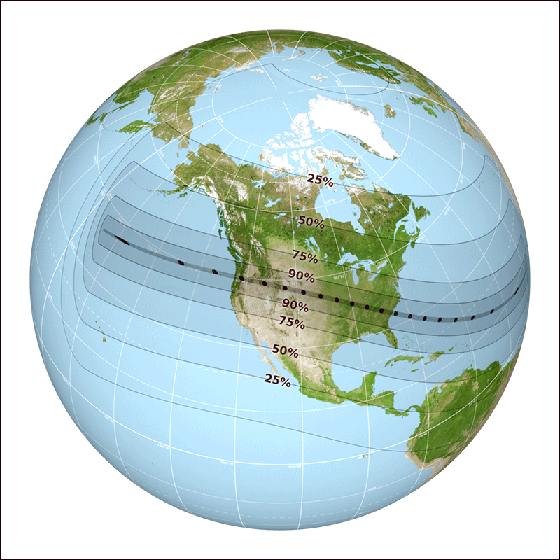 On Monday, August 21, 2017 a total solar eclipse will be visible along a narrow path going across the U.S., from Oregon to South Carolina. But did you know that you can see at least a partial eclipse that day no matter where you live in North America? And, of course, no matter where you live in the world, you can watch it online. As viewed from land, the total solar eclipse (“totality,” where the Moon completely covers the Sun) begins near Lincoln City, Oregon, at 10:15 a.m. PDT (1:15 p.m. EDT). Totality ends at 2:48 p.m. EDT near Charleston, South Carolina. That roughly 70-mile wide path is represented by the darkest line in the image above. But those above and below the path of totality can see a partial eclipse of the Sun, weather permitting. This neat NASA video shows not only the path of totality, but also how a partial eclipse will simultaneously appear to people across the Lower 48. NASA Television — If you don’t get it via cable or satellite, NASA will stream live coverage of the eclipse on nasa.gov/eclipselive, Facebook Live, NASA apps, YouTube, Periscope/Twitter. CNN will provide live online coverage. ABC News will cover the eclipse online, including from the perspective of eclipse watch parties across the U.S. Check out ABC’s online platforms on Facebook Live and YouTube. This simple, do-it-yourself device will project an image of the Sun that will show you the Moon covering the solar disk. Click here for directions from NASA on how to create a slightly fancier — even a creative — version of a pinhole projector (a.k.a. a “pinhole camera”). 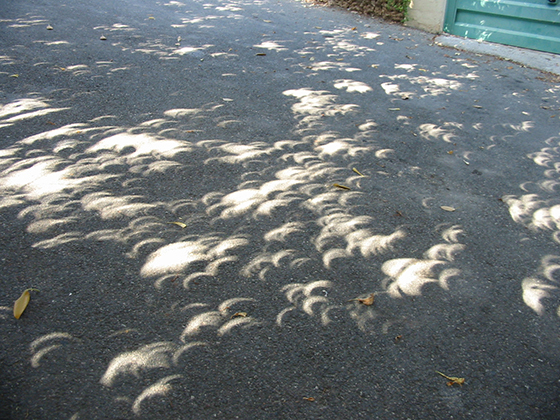 The tiny holes between the leaves of a tree act as pinhole cameras, projecting multiple images of the solar eclipse onto the ground. Mother Nature provides free pinhole cameras for us to use during solar eclipses! Just stand underneath a tree or tall shrub and safely observe the interesting, crescent shape of the Sun being eclipsed by the Moon. Here we cross the boundary from safe ways to view the eclipse to potentially dangerous ways to do so! You’ve got to be really careful using optical devices when viewing the Sun. Probably the safest way to do this is to attend an eclipse viewing event offered by your local science museum, astronomy club or astronomical observatory, where experienced and knowledgeable telescope operators will have the proper solar filters and telescopes for safe observation of the Sun. 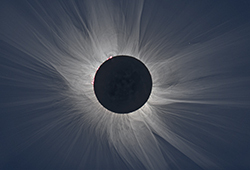 Click here for NASA’s list of eclipse events and here for a list of astronomy clubs and observatories around the world. Also, eclipse glasses cannot be safely used with unfiltered binoculars or telescopes! 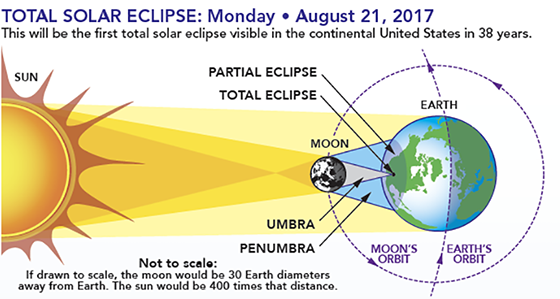 In other words, you can’t just put on eclipse glasses, aim your binoculars or telescope at the Sun and safely view the Sun that way. 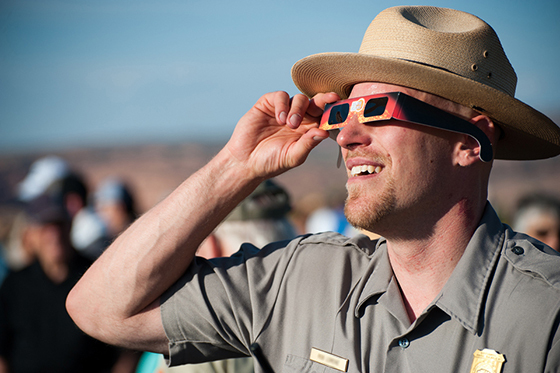 And, of course, everyday sunglasses can’t be used to observe the Sun either — with, or without binoculars/telescopes. 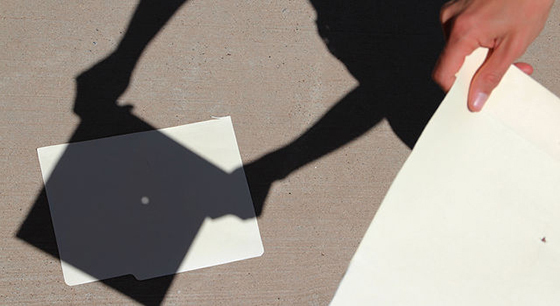 The safe bet: View the eclipse online, with a pinhole projector, or using a tree. Enjoy! 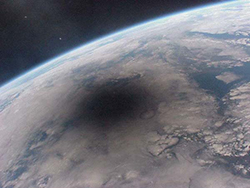 The Moon’s shadow on Earth during a total solar eclipse, August 11, 1999. This photo was taken from the Mir Space Station. It is due to a cosmic coincidence that we are lucky enough to view total solar eclipses at all. While the Sun’s diameter is 400 times larger than the Moon’s, the Moon is approximately 400 times closer to Earth than the Sun is. As a result, the Moon and the Sun appear to be around the same size in our sky. When the conditions are just right — when the Moon is on a direct line between the Sun and Earth — a portion of the Moon’s shadow falls on Earth, temporarily blocking the Sun from the perspective of the people directly in that shadow on the ground. 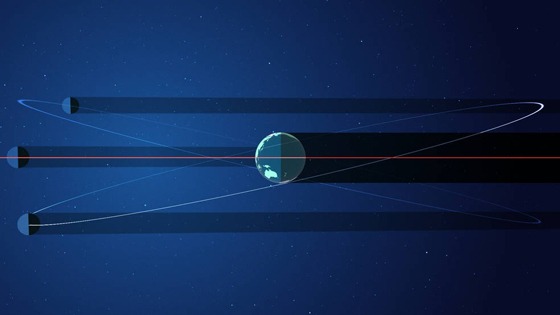 Due to their different orbital planes, the Moon’s shadow normally misses Earth each month. But we’re in for a treat August 21, 2017! Finally, here’s an interesting video that provides more information about how eclipses work, why they’re special, and why — if you can do it — you should totally go see a total solar eclipse! Previous Previous post: See shooting stars this weekend! Next Next post: Fall begins!